The Hotel Los Olivos del Convento, S.L. reservations system over the Internet allows for the making of reservations in real-time and for any date of the year, in accordance with the conditions established to such effect. When using this application it is essential that you provide your credit card number in order to confirm your reservation and your email address in order to enable us to send you any communication relating to the state of your reservation. This system allows you to make reservations on the same day as your day of arrival. The system will provide you with the details of the reservation made together with a confirmation number which should be used in any other operation or communication. 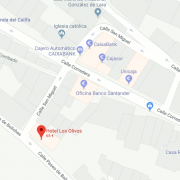 The confirmation of the reservation provided by the system will remain subject to the validation of your credit card details by Hotel Los Olivos del Convento, S.L. Consequently, in such case that errors exist relating to the provided credit card details your reservation will be cancelled. Upon consulting “Availability and Price” and “Confirmation of Reservation” the amount corresponding to your entire stay will be presented. It is possible to make modifications to a previously confirmed reservation in terms of the dates of arrival and departure, and other details of the reservation. No modifications may be made within a period of 24 hours prior to the arrival date. Cancellations made more than 24 hours in advance of the arrival date will not entail any charges in terms of a cancellation. To cancel or modify your reservation, please contact the hotel. E-mail: reservas@hotel-losolivos.es, Phone: (+34) 956 70 08 11. In case of non-presentation or cancellation within the aforementioned 24-hour period, Hotel Los Olivos del Convento, S.L. reserves the right to charge the amount corresponding to the first night’s stay on your credit card, in the form of compensation. For NON REFUNDABLE rates: This reservation NOT Accent cancellations or modifications. The payment is made at the time of making the reservation, that amount is NON REFUNDABLE. In order for your confidential information not to be intercepted, the communication between your computer and our server supports a security protocol denominated SSL (Secure Socket Layer), which guarantees the encryption of data and the authentication of the server so guaranteeing the person browsing our website that they are providing their information to a trustworthy company. Upon carrying out these operations you can confirm that your browser indicates that it is communicating with a secure server. All information will be treated in the most strict confidence and will only be used for the reservations purposes. Hotel Los Olivos del Convento, S.L. shall not be held responsible for the interruption, inaccessibility or fault of any other kind that the operating of the system may suffer, as a consequence of that which may occur in any of the telecommunications services or other accessories beyond the control of this organisation and necessary for the functioning of the same. In order to effect any operation requires a minimun age of 18 years. The carrying out of any operation implies the complete acceptance of the present general conditions. Hotel Los Olivos del Convento, S.L. reserves the right to hold to account the undue use of this system or the non-fulfilment of the regulations set forth in the present general conditions. The user shall be the sole person responsible in such case that the use of the service is carried out defectively, partially or erroneously, or in such case that someone acts in their name or on their behalf. Hotel Los Olivos del Convento, S.L. reserves the right to cancel access to reservations system to users trying to make ill use of the terms set forth in the present document. In the result of any disagreement that may arise, the parties, with the express resignation of their own jurisdiction, are subject to the jurisdiction of the Courts and Judges of Arcos de la Frontera (11630 – Cádiz).